Taking you to beautiful and terrifying depths. What is it An alien ocean survival adventure. There's an enticing-looking hole near my main Subnautica base. It's one of the more manageable underwater cave systems in the game as it's not too deep and it consists of tiered concentric circles of terrain with only a few tunnels leading off. The arrangement draws your eye to a plant called a rouge cradle and is ripe for a few screenshots. But this colourful, relatively simple space can still hurt or kill me easily. 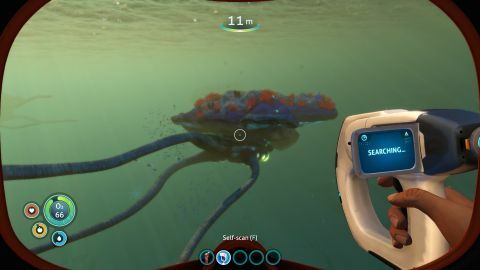 This particular segment of Subnautica's ocean-based survival adventure contains Drooping Stingers—poisonous jellyfish-like plants which hang down across tunnel entrances. There is at least one Sand Shark. I can see it throwing up clouds as it burrows along the sea bed below. There are mushrooms which I can harvest safely enough (and use to make batteries along with copper ore) but which, if I hit them with my survival knife, will release dangerous chemicals. I also spot a tadpole-shaped Biter which will nibble down my health bar given the opportunity. Beyond this there is also the capacity for death in the usual survival game ways. I could run out of food or clean water. I could also, given the underwater setting, run out of air if I spend too long captivated by caves and strange lifeforms. The latter is the most frequent cause of death for my little diver avatar. I just love investigating Subnautica's curated world too much! There’s a fledgling garden where I farm some vital resources. The basic premise of Subnautica is that you have crash-landed on an alien planet. You can see the burning hull of your ship, the Aurora, from your lifepod. You have no idea if you are the sole survivor, and you have no idea what lurks beyond the shallows. The first order of business is basic survival, so you start to potter in the vibrant sea outside your pod, seeking out resources to feed into your fabricator and start generating food, water and essential tools. You'll break open little lumps of sandstone and limestone to find deposits of titanium, silver, lead and more. A pillowy-looking fish is useful for water filtration, while others are good for eating. There are gigantic coral tubes to harvest bits from, docile creatures with long noses and glowing bums, and clusters of those bright mushrooms you use for making batteries. Once you've familiarised yourself with the core loops and built up a little toolkit you find yourself able to dive deeper, venture further and survive longer. Subnautica services your increased confidence with beautiful biomes, tempting you with new resources and new creatures. Helpful markers ensure you can always locate your base. I spent around 70 hours in Subnautica a few years ago, before the story was really implemented. I divided the time loosely between building an underwater base and exploring the world, letting the exploration loop back into the habitat crafting by using the trips to gather resources or pick up seeds from the local flora to create a little underwater garden. With the 1.0 release I find that even though I was trying to primarily focus on the story in order to deliver a review verdict I kept defaulting to a lovely, restful flow between three things: building up my habitat; exploring different zones; and pursuing the narrative. That's not great time management for a review, but it's such a great quality in the game itself, lulling me back into those patterns and letting the different forms of play lead into one another, depending on what I fancied doing. I know that undersea exploration isn't everyone's cup of tea, though, so you'll need to take your own comfort level into consideration alongside my recommendation of the game. One colleague finds jellyfish to be highly suspicious and discomforting entities and thus is not keen on those Drooping Stingers I mentioned. A former colleague has a phobia of crabs and might struggle with Cave Crawlers. One friend finds the entire idea of being underwater a struggle so I'd never suggest this to him, and another gets really freaked out by the idea of gigantic things lurking in the deep sea so would hate some of the zones. I'm at the opposite end of the scale. I find sea life endlessly fascinating. I adore the way the lighting and the art create the sense of each biome as being a distinct underwater creation, both alien and familiar. I love following the creatures around—even the more aggressive ones—and will happily front crawl my way into a curious labyrinthine cave system without remembering to lay a path of glowing markers so I can get back out. For someone at my end of the spectrum playing on Survival mode, the worst that can happen is you lose a bit of progress when you die in said cave system, or you get a jump scare thanks to an aggressive creature swimming up behind you. I won't spoil it for you but something a lot further out in the water destroyed my little submersible craft in an instant. That sense of being turned around, confused, threatened and suddenly stranded two kilometers from "home" is the closest I've come to panic. "Home", by the way, is a gigantic, sprawling base near a thermal vent. You go in via a little hatch and find the main manufacturing and storage facilities. The further you go the more the base errs towards decoration and relaxation. An observatory is in danger of becoming a greenhouse, glass corridors offer a look at the glowing plants in the outdoor grow beds, my bedroom is a repository of scavenged knick-knacks. The deeper you go, the weirder things get. In terms of irritants, there are a few. One is to do with pop-in, both of objects and textures. I don't mind it too much because it feels like a logical casualty of how believable undersea set design has to work. Swimming through clear ocean towards a point means there are none of the usual obscured viewpoint moments you can usually use to swap in more detailed textures or sets of objects. Acquiescing doesn't mean you won't notice it, but I'll take the trade-off if it means the game can run properly, and I still get some truly lovely landscapes to experience once I'm close enough. Habitat-building can also be finicky. For example, I have absolutely no idea why one of my multipurpose rooms won't let me add glass windows but the rest will. More information when you're placing objects would make it much less frustrating—this room needs this much clear space below, or this interaction is causing a problem. In the later game I ran into some truly frustrating issues. In one, I left my Seamoth craft to look around and returned to find it had "burrowed" about two meters into the floor. There was no way to extract it so my choices were to abandon it and go through the rigmarole of collecting all the resources to build it (and its upgrades) again, or to bring up the debug console, spawn a deprecated item called a terraformer, and dig the thing back out. These harmless grazers drop gassy pods from their butts. About six hours later my massive submarine became unable to move in a really deep cave system. I tried everything I could think of, from removing the clinging life forms, to using my forbidden terraformer to try digging it out but to no avail. As such I've had to abandon it. The craft itself is a big resource and time investment, but it also contains the Seamoth at a depth the Seamoth can't survive if I undock, so that's gone too. A more flexible save system would have been ideal here. If I had multiple save files for the same playthrough I could have gone back a little and tried to avoid the problem. Unfortunately I had saved after getting into the pickle and you only get one save per version of the world. From a file size point of view it makes sense, but it means glitches can be monumentally costly. To put these negatives in context, though, I have spent nearly 50 hours on my current playthrough and my total playtime is over 120 hours. I am actually still playing (although I did indeed rage quite twice because of the vehicular issues). I have more than 2,000 screenshots of the beautiful world and its strange creatures, and now that the review is over I can go back to meandering at my own pace. It is, without doubt, my favourite game of the last five years.